When we established our furniture painting business in 2012, my daughter Karla and I vouched to never paint over vintage hardware, the way we saw some people do. That led us to spend lots of time scrubbing and polishing the hardware in the traditional way with metal polish. 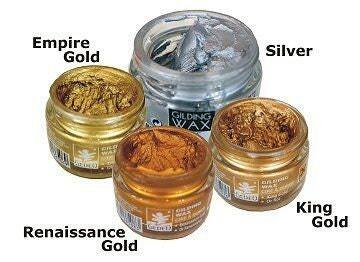 Fast forward a couple of years to when we stumbled upon this luscious gilding wax with its vibrant metallic colors. A dream came true of no more polishing hardware! The following points are why we love it and use it almost exclusively on the hardware of our painted furniture pieces. This French Gilding Wax can be used on practically any kind of surface such as metal, glass, wood and paper. In this picture, we used it to embellish wooden trim on this stunning curio cabinet.